Even without music, Les Misérables sings: a tearful lament for the poor and oppressed, a rousing cry for justice in an unforgiving time, a soaring appeal for the transformative power of love and mercy. On Sunday, April 14, Victor Hugo's mammoth 19th-century novel, filmed many times and famously musicalized, finally gets the deluxe Masterpiece treatment, courtesy of veteran screenwriter Andrew Davies (1995's Pride and Prejudice, Bleak House). The new TV series premieres in April. His approach over six episodes, with director Tom Shankland, leans into the misery of its turbulent era with an epic wallow in noble suffering. 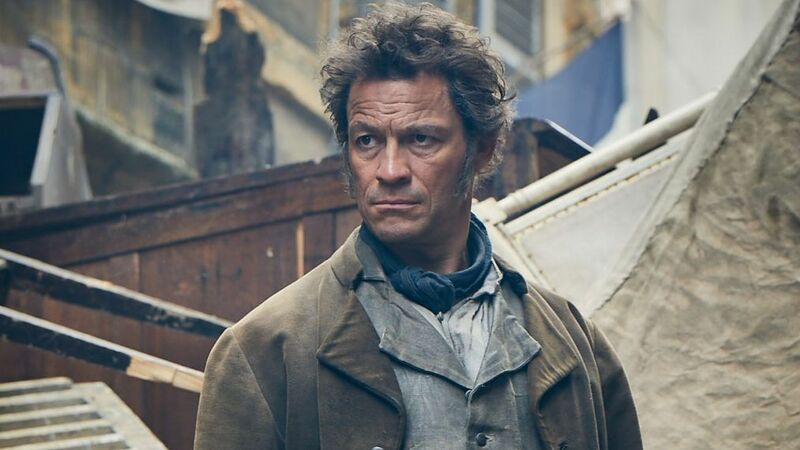 The story's unfairly persecuted hero, Jean Valjean (a robust, impassioned Dominic West), is introduced as a dehumanized and blisteringly red-faced convict, so soured on his fellow man that he never feels truly worthy of kindness or compassion. "Lies, violence, cruelty: That's the world," he later warns his beautiful and cloistered ward, Cosette (Ellie Bamber). Who could blame him? Dogged at every step by the irrationally obsessed policeman Javert (an intense David Oyelowo), Valjean also harbors guilt over the fall from grace of Cosette's victimized, exploited mother, Fantine. Lily Collins plays this ill-fated heroine with heartbreaking conviction throughout her harrowing descent from dreamily seduced ingenue to abandoned and disfigured wretch. Her unrelieved despair is hard to watch, and that's the point. This Les Mis sugarcoats nothing. When Valjean rescues Cosette's wounded suitor, Marius (Josh O'Connor), from the blasted barricades of a futile citizens' rebellion and carries him through the Paris sewers, the grime and stink nearly ooze off the screen. The Dickensian villains of the piece, the greedy Thénardiers, are wonderfully and colorfully portrayed by Adeel Akhtar and the great Olivia Colman (The Favourite). But these scoundrels' monstrous actions, grounded in abject poverty and desperation, are never softened for mere comic effect. Josh Groban, Gloria Estefan and Emilio Estefan also stopped by to promote their concert specials. From its opening image of Waterloo's killing fields to the final fade-out on street urchins lost amid the gritty urban squalor, Davies's sprawling adaptation satisfies our desire for spectacle and romantic tragedy with socially relevant purpose. Like Shakespeare, Les Mis will never go out of fashion.